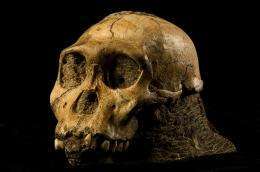 (PhysOrg.com) -- Last year Lee Berger from the University of the Witwatersrand and his team discovered the skeletal remains of two specimens they determined to be a new species of human called Australopithecus sediba. The skeletons had characteristics of previous species of Australopithecus, but also of Homo, leading the researchers to believe they may have found an evolutionary connection between the two. This became a very controversial idea, with many believing there was no connection to Homo and that what they had discovered was really an ancestor of later Homo species. Kristian J. Carlson discussed the size and shape of A. sediba's brain, showing that by synchrotron scanning of the interior brain case, they were able to determine the estimated capacity to be around 420 cubic centimeters. This led to a very small brain size and is the reason researchers first determined these new skeletal findings to be in the Australopithecus genus. However, they also discovered that the frontal lobe of this small brain contained organization more similar to that of humans, showing that contrary to what was previously thought, organization and brain size with human characteristics may not have been a simultaneous change. Well I'll be a monkey's uncle. Looks like Tarzan the Ape Man was not too far from the Mark. I think I will go find a Jane, eat bananas, and coconuts, swing from trees, and dream of being an English Peer. could be? could be related to mr potato head too, but so what. Very interesting if it holds up. I wonder if it also might be an ancestor of Floresiensis who had wrist bones like Australopithecus and made stone tools that were more sophisticated than should be possible with it's small brain size.